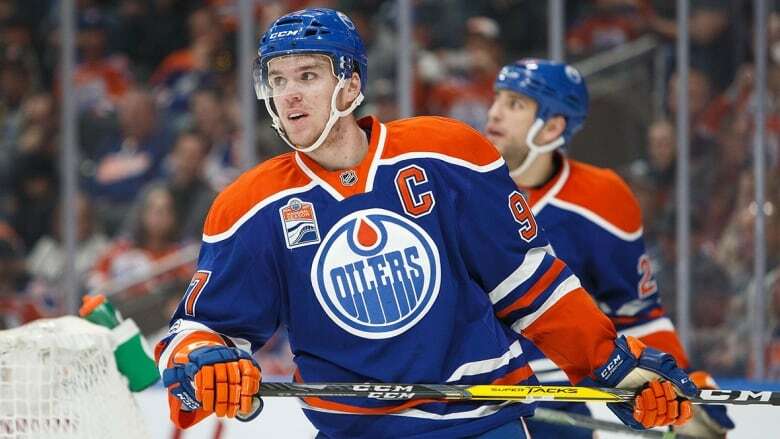 Edmonton Oilers star Connor McDavid wants children to know that if he wasn't weird growing up, he wouldn't be who he is today. That's one of the major themes in a new kids' book simply titled Connor McDavid, by author Lorna Schultz Nicholson. "When he was growing up he was the different kid who wanted to be on roller blades and wanted to be practising in his driveway," the author said in an interview on CBC's Edmonton AM Monday. "The other kids would be saying, 'Do you want to go do Playstation?' and he'd say, 'No I think I'm going to practise just a little bit longer.' "
McDavid told her setting up obstacle courses in his driveway was something he genuinely enjoyed doing, so to him it wasn't weird at all. Ultimately, he credits his unusual behaviour as a kid for his success as a player today. "People will say that he's extraordinary, but it really is extraordinary hard work," says Schultz Nicholson. The author spent time with McDavid and his parents, digging into his path to the NHL to find out what it took to become arguably the best player in the world. Being married to Bob Nicholson, Oilers Entertainment Group CEO and vice-chairman, has little to do with her love for writing hockey books, she said. "I'm a big believer in literacy," says Schultz Nicholson. She started writing years ago, when she realized her son wasn't really into reading. "The very first book that I ever wrote was a hockey book that was for reluctant readers," she says. "This is a good opportunity for me to write a biography that I know boys are going to read." The book is a mix of text, comics and photographs to help keep kids engaged. This book in particular is published by Scholastic, and is aimed at eight to 12 year olds. Schultz Nicholson has written a handful of books for teens as well. "My teen novels that I've written are all about diversity and integration, and a totally different write," she says. Writing for kids has some unique challenges, but in the end, Schultz Nicholson feels a direct connection to her small readers. "Children are a really great audience … they're immediate, so there's that response. Adults will mull over it, but children will give you that immediate response like 'Oh my gosh I loved your book," she says. Despite the current culture of online and mobile-device-driven entertainment for kids, Schultz Nicholson is hopeful authors will continue catering to kids. "I think that if there's enough of us children's authors that are writing, we're going to continue to sell these books and get these books into libraries and into the hands of children," she says. Amazon and Chapters Indigo have picked up the book. Schultz Nicholson will be at Audreys Books in Edmonton on Nov. 19 for a reading and book signing.